The Animator Field is also different form the previously seen guides. Indeed, as soon as you create it, a virtual numeroted grid appears. 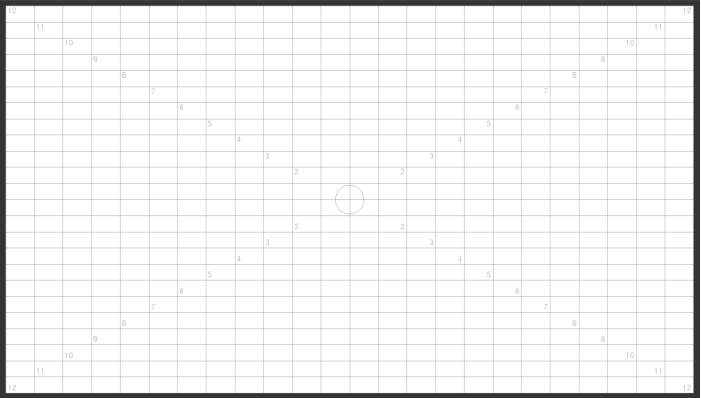 This grid is well known by traditional animators . Also called Field in the Animation traditionnal language, this field has helped animators for a long time. You then have access to all of its options in the Guidelines panel. Contrary to other guides, only the Eye option is present (same utiity and parameter). You can change the Color of these virtual lines by clicking on the small grey (by default) square to obtain a picker. You will then be able to pick another color in the Color Panel or in the software's interface. 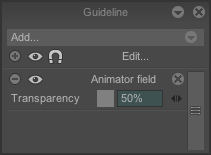 The Snap and Assist functions does not exist for the Animator Field guide. The Edit function is not active for this guide.